The Sony Xperia Z Ultra is the company's first ever phablet and with an expected global debut in September, the smartphone is topping the wishlists for a lot of people. One of the reasons for the excitement is its 6.4" Triluminos screen with 1080p resolution. The screen not only has the nice sounding 344ppi pixel density but it also uses Sony's OptiContrast and X-Reality tech, which is the successor of the Mobile BRAVIA. But how good is it actually? Vietnamese website Secafe tries to answer this question by comparing it to the 4.7" full HD Super LCD 3 display of the HTC One. As you can tell from the photo above, the Sony Xperia Z Ultra 6.4" display produces more saturated and vibrant colors than the display of the Super LCD 3 display of the HTC One. Contrast is superior as well, thanks to Sony's OptiContrast and X-Reality baked into the display. Even though the pixel density of the Xperia Z Ultra screen isn't as high as that of the HTC One's display (469ppi for the One against 344ppi for the Z Ultra), Sony's phablet doesn't appear to struggle with the sharpness. Naturally, we'll pass a final judgement when we get to see them both in person, but looking at the photos below, the Xperia Z Ultra's display is almost certainly the best one Sony has produced to date. 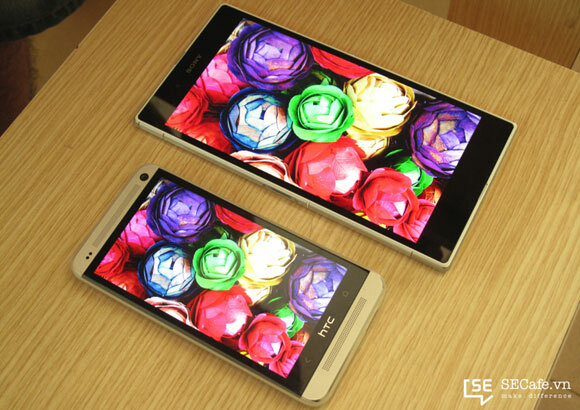 Here are some of the Sony Xperia Z Ultra vs. HTC One display comparison photos for you to judge. The Xperia Z Ultra is powered by Qualcomm's most powerful chipset to date - the Snapdragon 800 - featuring a quad-core 2.2GHz Krait 400 processor, Adreno 330 graphics and 2GB of RAM. We had the chance to put this beastly configuration under some benchmarking treatment and the results were astounding. And there is you in every page.